In a letter addressed to elected officials, Port of Seattle Executive Director Stephen Metruck and Northwest Seaport Alliance CEO John Wolfe announced that the Port opposes both a movable Ship Canal bridge, and an Occidental Avenue alignment for the West Seattle extension. The Harbor Island container terminal. Credit: Shane in the City. “Moveable bridges across the ship canal should be eliminated as alternatives as they will not work for transit and could impede maritime mobility,” the cosigned letter says. The letter aligns the port with transit advocates who oppose a movable Ballard bridge, citing reliability and travel time concerns. The Port cautiously endorsed building “a 15th Avenue-aligned Tunnel under Fishermen’s Terminal,” as long as ST does not build a ventilator shaft in a shipyard named Fishing Vessel Owners (FVO.) According to the Port, FVO has operated from its current site for 99 years. The Port also opposes aerial crossings through Fisherman’s Terminal “because of impacts to terminal operations and repercussions of the fishing industry. [sic]” The leaders also argued against aligning the extension on 20th Avenue West. The leaders also asked Sound Transit to “evaluate” a Duwamish crossing to the south of the West Seattle Bridge, at the “far southern tip of Harbor Island,” in the hope that the agency can find “ways to further reduce impacts to existing businesses.” The Port categorically opposes building the line to the north of the West Seattle Bridge. Metruck and Wolfe also wrote that the Port opposes “adding a station west of the BNSF mainline,” and argue that such a station would threaten the area’s current commercial and industrial land use. The Port opposed the proposed Sodo basketball arena, which would have been built in the same area, for the same reason. Most troubling, the Port leaders also oppose building a line on Spokane Street. All of ST’s latest West Seattle concepts are located near and parallel to the Spokane Street viaduct between 4th Avenue South and the Duwamish River—except for the “Pigeon Ridge” concept, which ST believes to be the most expensive option. The Port’s flat out opposition to an Occidental alignment will disappoint some transit advocates. An Occidental alignment would serve Starbucks’ corporate headquarters and the growing 1st Avenue South job center much better than a station near the existing Sodo Link stop. Sound Transit did not tip how the Port’s comments will affect planning. The Port’s preferences—particularly on the Ship Canal crossing—would have the welcome effect of optimizing travel times and other quality of service concerns. Like many major employers, the Port’s bosses are enthusiastic about system expansion. What a bunch of negative Nancy’s. It seems like the Port can only oppose transit and not offer any suggestions to go with their opposition. And the irony of a Port Executive Director named Me-Truck. The letter is not the personal view of the Executive Director. It is the position of the Port of Seattle, whose Board we elect. Follow Willie Nelson’s advice if you don’t like whose in there. But more to the point, be more or equally able to discuss what’s technically involved in the project. Especially soil conditions, which south of Jackson, include a lot of water. And given effects of climate change on Elliott Bay levels, might not a north-south subway through Beacon Hill work best? With cross tunnels carrying streetcar or bus to SODO neighborhood ’til boats work better? In other words, keep the conversation less to what the Port of Seattle wants and more to what King Neptune wants. That’s not a seafood fork he carries. Or whoever is the local deity whose job it is to keep travel- and of not drowning- in the hands of the capable. Rather than the temporarily influential. They recommended that we vote out every port commissioner. Drain the swamp, so to speak. Reminder that the Port of Seattle is taking 72 million per year ($68 per median house) from King County property taxes and using that money to advocate for freight trucks, cruise ships, and worse transit. Right. I’m glad the Port favors a ship canal tunnel to avoid impacts to shipping from a moveable bridge or to Fisherman’s terminal from a fixed bridge. Now they can put my tax dollars where their mouth is and commit to partially funding the difference in cost that requires. Yep. Bellevue made the case for a tunnel with ST2, and partially funded the difference in cost. Yay Port! At least on the Ship Canal crossing they couldn’t be more correct, a movable bridge option is very short sighted and doesn’t make sense for transit or vessels. Not to mention any options that require leveling half of Ballard to build track and stations will be stuck in 30-40 years of legal challenges and come in about $1 billion over budget as they start to add up all the costs for acquiring the needed property. Since the port controls the required ROW to build most of the proposed bridge alignments those options should finally be crossed off. They’re probably feeling a little tight on cash at the moment. The letter also mentions an interest in Smith Cove Station and cruise ship access. I’m glad that the Port is showing interest. Cruise ship travelers aren’t all headed to the airport! Some even like to stay in Seattle and visit for a few days — and local residents like to board cruise ships too. The port is correct about a Ballard drawbridge but the rest of their comments are essentially industrial NIMBY. Kind of suprised they weren’t interested in a better SODO stop for commercial uses. The rest of their comments amount to: Don’t build near us. No, they are wrong about the entire thing. Actually, that is not fair. They are right to protect their interests, and their interest is in preserving the existing port infrastructure. So when they say “No aerial alignments through Fisherman’s Terminal should be considered further because of impacts to terminal operations and repercussions of the fishing industry” it makes sense. They aren’t arguing for better transit (quite the opposite — they simply don’t care). They are simply arguing on behalf of their constituents. That is a ridiculous statement that is being used to support their preferred alternative (a tunnel). Both parts of the statement are ridiculous. “Movable bridges will not work for transit”? Since when? Movable bridges are just find for transit. Movable bridges work better for transit then they do for automobile traffic. Bridges built exclusively for transit don’t have backups. That is key. A bridge operator can simply wait until a train passes, then let a boat through. That means the time delay is the time spent opening and closing the bridge minus the time until the next train comes. More often than not, that will be zero. In other words, on the rare occasions when a bridge is open, no one will be delayed. As I mention below (https://seattletransitblog.com/2018/10/02/port-comes-out-against-movable-ballard-bridge-occidental-alignment-for-link/#comment-808410) the movable bridge option is bit better than a high bridge in overall travel time. The tunnel (the only option the port supports) is by far the worst. Put it this way: would you rather have a couple delays of a minute each month (and never at rush hour) or would you rather spend an extra minute getting to the surface each and every time you use that station? As far as the other part, that too is ridiculous. A movable bridge “could impede maritime mobility”? This thing is going to go right next to the other bridge! It is also higher, and thus will open less often. Are they basically saying we should remove all movable bridges in Seattle? I wonder what they think of adding another bridge over the ship canal, to improve bus travel (https://seattletransitblog.com/2013/04/12/a-better-ship-canal-crossing/). Yeah, of course they would oppose that. I get it. They want what is best for their constituents. But the Port is simply making up BS reasons to support their cause. “That is a ridiculous statement that is being used to support their preferred alternative (a tunnel). Both parts of the statement are ridiculous. “Movable bridges will not work for transit”? Since when? Movable bridges are just find for transit. Movable bridges work better for transit then they do for automobile traffic. Bridges built exclusively for transit don’t have backups. That is key. A bridge operator can simply wait until a train passes, then let a boat through. That means the time delay is the time spent opening and closing the bridge minus the time until the next train comes.” right of way rules by the Coast Guard are explict, the maritime traffic always has right of way, so the boat won’t stop the transit would. Go ride Trimet MAX when martime traffic raises the Steel Bridge. MAX is a nightmare during fleet week. Yeah – Not sure why anyone would support a movable bridge at this point. There is room in the budget for a high/fixed bridge. If the Port wants to pony up a few hundred million for a tunnel, that works too! There aren’t that many tall ships that visit Lake Union any more. Suppose you had a movable apan that only needed to be opened once every few weeks? Or once every month or so? Chicago and New York have subway lines with moveable spans. It’s no big deal because stuff big enough to cause them to open isn’t that frequent. right of way rules by the Coast Guard are explict, the maritime traffic always has right of way, so the boat won’t stop the transit would. Go ride Trimet MAX when martime traffic raises the Steel Bridge. Absolute nonsense. Maritime traffic routinely is delayed by the bridge operator. A bridge operator has the right to delay a ship for several minutes. This happens all the time. Go ahead, hang out next to the Ballard Bridge sometime. Listen to the back and forth from the boats and the bridge operator and you’ll figure out the code. Since I worked there for several years, I remember it well. A boat approaches, and sends out a long and short blast. The bridge operator then replies with the same thing (meaning I’m about to open the bridge) or five blasts (meaning the boat has to wait a while). This all makes sense if you think about it. During the weekend, you might have the bridge open up for three sailboats. The last sailboat barely got there (having to gun its tiny little gas motor to make it). Just as the bridge closes, and traffic starts flowing again, another boat approaches. Do you think a bridge operator, looking at traffic backed up for miles, would open the bridge again? Of course not — they give the five blasts and the boat has to wait. I’m not talking about a huge delay. I’m talking about asking the boat to wait a couple minutes, which happens all the time. Keep in mind that 520, until recently, had bridge openings. But bridge openings were rare, and scheduled. Also keep in mind that none of the bridges open during rush hour. None of them. The main requirement is that boats be allowed to pass. Other than that, everything is very flexible. For a 70 foot bridge (that will never, ever, open during rush hour) it really isn’t a problem. From what I understand, the West Seattle lower bridge never holds up maritime traffic for cars and bikes. Other than that, if the port doesn’t want to pay for a tunnel to avoid movable bridges, it should kick sand. We are their constituents. It isn’t so much Not In My Backyard as Not In My House. “Backyard” in the slogan really means neighbor’s houses and the public street and street parking. But if a development really takes part of your back yard or part of your house, then you can find another house in Auburn. But if development displaces or hinders some of the Port’s operations, the Port can’t just move to Auburn. The ships won’t fit in the Green River, and they wouldn’t want to go that far out of the way anyway. The Port has a lot of jobs, and family-wage jobs at that, and it rounds out our economy so we aren’t just dependent on high tech and environmentally-wasteful airplanes. 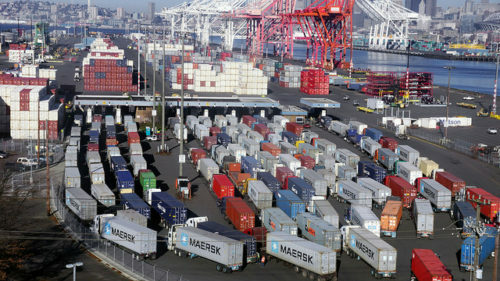 Hindering or displacing some of the Port’s operations is like telling Boeing, Amazon, or Microsoft to take a hike. We can do that but it’s a lot larger issue than just trains to SODO retail or a few condos on Thorndyke, so we should give it the thought and consideration it deserves, and it’s not just our decision but the residents’ and councilmembers’ in total. People are making armchair assertions about the Occidental and Thorndyke alignments without showing that they have any expertise or familiarity with Port operations and what the impacts of these alignments would be, or expertise to judge whether they’re significant or can be worked around. In the absence of external experts we have to take what the Port says seriously and not just wave it away as NIMBYism. That’s what the ST board will do in any case, since it can’t just ignore the Port’s economic importance in the region. and not just its political clout. Many voters believe the main purpose of Link is access to jobs, and here are jobs. How will you tell them that these jobs aren’t that important? The Port and related industrial businesses have a long history of claiming that ANY impact is too much impact and digging in on that position. We saw it with the SODO stadium in which they claimed games that start at 7 would have a huge impact on Port operations that close at 4. Occidental was involved in that discussion too — their repeated claims of impact on that very low traffic road were clearly spurious. The same thing has occurred with the missing Link. A flip side of the same thing happened with Bertha and Lander. Where the port is involved it’s become pretty clear that people who care about transit should be wary. If there are credible reasons not to build at a particularly location — such as permanent impacts that cannot be mitigated — Sound Transit will find them in their study work and weigh them against other concerns. Until then, all of us should take literally everything said by the port with a grain of salt. The Port is heavy-handed and more than a little duplicitous, as we saw during the arena situation. I was not pleased to see them weigh in here in the manner in which they have done. The fact that they once again have raised the spectre of the oh-so-heavily-trafficked Occidental is the punchline to a bad joke. I, too, hope that ST will proceed in selecting the best possible routes for the new lines, and if that dovetails with what the Port wants, great. If not, the Port can pony up some cash or just go away. A high drawbridge costs less and brings nearby stations closer to pedestrian level (improving station access) all for almost no practical impact due to openings. Why some people continue to insist that a high drawbridge is the worst thing ever makes no sense to me. There’s a lot of sailboat traffic through the canal. Most large sailboats are designed to be able to navigate the Intercoastal Waterway and therefore have a mast height of less than 64′. To minimize bridge openings, your proposed high drawbridge would need to have at least that amount of clearance at the highest level of the lakes. By way of comparison, the Ballard Bridge has a clearance of 44′. The drawbridge would be 70 feet high: https://seattletransitblog.com/2018/10/02/port-comes-out-against-movable-ballard-bridge-occidental-alignment-for-link/#comment-808431. As RossB said, the plans call for a 70-foot-high drawbridge. That gives you a span that would open infrequently (and never at rush hour). The station access height isn’t particularly different between the high bridge and draw bridge. Multiple high bridge options are affordable without additional local funding. So yeah; why go on about the drawbridge at this point? A high fixed bridge would be (at minimum) double the height of even a high drawbridge. Any station in the vicinity of the bridge will absolutely be higher if the fixed bridge is chosen. The Port’s preferences—particularly on the Ship Canal crossing—would have the welcome effect of optimizing travel times and other quality of service concerns. How so? Really — please explain your reasoning, but I think it is the opposite. 1) Fixed Bridge (opposed by the port) — The stations would be higher than a movable bridge (for both Interbay and Ballard) but closer to the surface than with a tunnel. 2) Movable Bridge (opposed by the port) — This wouldn’t open during rush hour, and would not open that often in general (it would be substantially bigger than every other ship canal drawbridge). Since it doesn’t take too long for a bridge to open and close, and the trains don’t run that often outside of rush hour, it will be rare that a ship delays a train. Very few riders would ever experience a delay caused by a ship (and it is quite likely such an occurrence will be welcome — e. g. when the tall ships come into town). The stations for a movable bridge will be the closest to the surface. 3) Tunnel (the only option the port supports) — The Ballard station would be very deep underground (from what I’ve read, deeper than UW). Time spent getting to your destination would depend on the height difference between the station and the surface. Clearly, the worst possible option — the one which would cost riders the most time — is the only one supported by the Port. Basically the port doesn’t care about transit. That is clear with every part of this letter. Thanks for mentioning the station elevations! It’s not just how much delay an opening would create — but conversely how much longer will it take every ride to get between the platform and the street. Let’s say that the bridge opening affects 5 percent of the riders for 4 minutes — but a bigger elevation change affects 100 percent of the riders for 30 seconds. That’s 20 times more riders affected and 2.5 more aggregate station/line user time loss (if my math is correct). There are plenty of reasons to argue for a tunnel — but I think the full travel time impact to riders needs further analysis of not only the time in the train but also the time inside the station. If you do the math, the tunnel option is orders of magnitude worse. I’ll make some assumptions here, but just for fun, I’ll be very conservative. A taller bridge will open rarely, but I’ll be generous and say once a day. A bridge will never open during rush hour (they don’t now) which means that trains won’t be running that frequently when they do open. But I’ll be generous again, and assume trains are running every six minutes. It doesn’t take that long for a bridge to open and close, but I’ll assume five minutes (way more than average). I’ll also assume that the trains are timed in the worst possibly way, which would mean that a train goes by the bridge every three minutes (one direction or the other). That means a train goes by, the bridge operator gives the boat a couple toots and the bridge starts opening. Three minutes later, the other train arrives. Two minutes later, the bridge is down and the train starts moving again. So that works out to two minutes of delay for one train. Just to make the math easier, I’ll assume 100 people in the train. That is 200 person minutes of delay each day. Now assume a walk to the platform from a tunnel will take thirty seconds longer than a walk from an elevated station. Each rider makes a round trip each day, so that is a minute of delay for each and every rider. I’ll assume each train carries an average of 100 riders (meaning the off peak average is exactly the same as the peak average — again, I’m being generous). I’ll also assume that the train runs the same off peak as on peak (every six minutes). That works out to 1,000 riders an hour, every hour. Just to make it simpler, ignore late night service, and just imagine it running 12 hours a day. That is 12,000 riders a day, or 12,000 person minutes of delay each day. Even being really generous — at each and every aspect of this system — the movable bridge saves a huge amount of time. Sixty times as much! It isn’t even close — the elevated options are the best. It isn’t clear how much extra time it would take for a large bridge versus a movable one, but even a small delay (one flight of stairs) would make the movable bridge the better option. Do the math with a ten second difference and the movable option is still the best option (although the high bridge is nowhere near as bad as the deep tunnel). A bridge that opens rarely (and again, never at rush hour) is really not that big of a deal. The movable bridge only becomes a big deal when it brakes down. Yes you’re numbers seem more reasonable, RossB. I was actually pretty conservative about impacts. A higher moveable bridge would probably affect less than 1-2 percent of daily riders. I really wish that average pedestrian station access times would start be analyzed by ST in general. It’s seemingly easy to calculate. The qualitative debates about lots of these options would be put in better focus with actual data. Even without rider forecasts, a simple pedestrian travel time estimate from key locations near stations (entrances, bus stops, popular corners or buildings) would end all of the emotional unquantified outcries about any station’s merits including those in West Seattle, SODO, Downtown, SLU and Interbay too. Months ago, I suggested that average pedestrian travel times be reported in this study process. This situation with the elevations illustrates its benefit. Hopefully, those in power will start asking for this simple quantitative analysis. Ian, I might be mistaken but I believe when most drawbridges fail, they can still be used in the down position. A failure would likely impact shipping rather than light rail. How often does a modern movable bridge get stuck in the up position! Hey, I bet they allow trains to cross a bridge stuck in the down position; too bad they don’t do the same with passengers and stuck escalators. At the recent meeting in Ballard, the ST staffer manning the bridge visuals said the movable bridge would have separate movable structures/mechanisms for NB and SB so that single track operations could maintain service if one of the mechanisms or spans was damaged or needed service. Every system has outages. If you doubt me, try riding the New York Subway (the best in the country) for a week. Even our system has occasional outages. Why look at that, as I write this: https://www.seattletimes.com/seattle-news/transportation/cracks-in-light-rail-tracks-slow-trains-in-south-seattle-expect-closures-for-repairs-over-weekend/. Of course maintenance costs money. Just the difference between a tunnel and elevated would pay for a lot of maintenance. My guess is that if you took that approach (i. e. spent enough money so that the system never broke down) then a bridge is still more cost effective than a tunnel. Yes, tunneling below a bay will require greater depth than tunneling below The Cut. Let me add that Ballard Station is likely to be a terminal station for many years. Trains on an elevated track will have a clearer view of the station, and thereby a safer, and slightly faster, approach. Trains in a tunnel often have to sit at the lightswitch waiting to see the vertical white line, and then approach on faith that the signal equipment is working. Don’t consider the Port’s letter as an absolute obstruction. We can replace their board members who refuse to relent on allowing temporary construction impacts on Port property. One point they are correct about that nobody else has seemed to care is that having a station on 1st Ave will make that location a draw for more office space, retail commercial, and possibly housing. Their point that using that land for portage purposes is the highest and best use for the local economy is quite valid, IMHO. I don’t think it’s correct to say the port opposes fixed bridges. They oppose fixed bridges that cross Fisherman’s Terminal. In my mind this letter means the 14th Ave Fixed Bridge just moved to the top of the heap. (As the arena debacle shows, what the port wants, the port gets). That’s fine: the 14th alignment makes the most sense anyway. A movable bridge would be fine (unless the port is planning on paying to replace the Ballard Bridge with a tunnel, where’s the marginal impact on vessel movement?) but a fixed bridge does provide some reliability improvement for transit. That’s also how I also read it, Ron. The Port letter is very clear that they don’t want to disturb the Fisherman’s Terminal area — even calling the area ‘landmark’ worthy. The complaints about moveable versus fixed is very generic, and an acceptable height of a moveable bridge is not discussed. There are also concerns about a Fisherman’s Terminal tunnel that are stated. The Port seems to mostly say that it’s ok to use anything east of 15th Ave. The letter is mostly about the alignment more than the elevation. I’m not sure how much sway the Port has. The option for the 14th is the worst. It is terrible for bus integration, terrible for people who walk to the station and terrible if they ever wanted to expand this north (towards 85th). My guess is that if they simply went with the representative project (the thing that people voted for) then they could overcome the Port’s dissension. It probably gets more complicated when they move towards something else (yes, the Port will object, but if they add a bridge east of 15th on Queen Anne I would imagine a lot of folks there would object). I really don’t think the Port’s opposition to a new arena killed it, I think there were other problems. It is a very anti-pedestrian area, and was overrated from a transit standpoint. That wasn’t obvious (until people looked at the monorail and compared the walking time) but once they looked into it in more detail, it became clear that the SoDo location was bad. It would have had more drivers than the Seattle Center. Even that wasn’t the big issue — eventually it just came down to money, and the folks who wanted to rebuild Key Arena had more of it. Oh, I agree the SODO arena might well have stalled for other reasons. But that alley vacation being denied was pure Port/union influence. I think the Port has a lot of sway here: they own the land Fisherman’s Terminal sits on. If they’re not willing to give up the rights for temporary construction access and permanent sites for bridge supports, what happens? Sure, ST could initiate eminent domain proceedings against the Port, but that’s such a WTF move that it would have the media in a frenzy. Not a practical course of action. So really, I’d say the Port has a de facto veto over routes they don’t like where their property would be needed for construction. It look awhile, but I think Ross has me fully bought into the argument that elevated is superior to a tunnel due to the time & effort needed to move people in & out of a tunnel station. Unless the tunnel is shallow (think ID station), it’s a significant time penalty. AJ, think about long sloping underground city streets, restaurants, shopping and all, from entrances far enough away from the platforms that not only could they better located for community preference, and also cheaper. Train control- by signal, not sight. But really have had it with this spite about the Port. Anything as machine-oriented as the Port as we are should be best able to make it’s moving parts cooperates. Also, compare wages and benefits with ones that Jeff Bezos is celebrating. For a major industry, would miss him and everything about his company a whole hell of a lot less. How high would a movable bridge be above the water? This is the key to understanding how often it will open, but I don’t see that distance mentioned here. Related – how how high would a fixed bridge be? My understanding is that it would be in excess of 70 feet high in order to keep openings to a minimum. A fixed bridge would almost certainly be at least 167 feet high (the height of the Aurora bridge. The higher the bridge the further back the abutments will be, (Up the bank and way from the water) which will intern create a longer span. The real question about the span will be placement. “We fully support Sound Transit’s objectives of promoting mobility in our region,” Metruck and Wolfe wrote. Like with Metruck, whose job is to represent the elected Port of Seattle Board, Wolfe’s job is to represent the Northwest Seaport Alliance, a partnership of the Port of Seattle and Port of Tacoma (also an elected board). Don’t like the opinions of the boards? Throw ’em out. An “Occidental alignment” is very difficult to achieve. There are a large number of street and building piers embedded in the fill between First and Fourth Avenues. Good to hear their suggestions on the West Seattle Link alignment in SODO. It’s like NIMBY, but “my backyard” includes every road that trucks can drive on. I wonder if the Port of Seattle has any feedback on the future Federal Way-Tacoma Dome Link extension. Since I’m sure they have trucks operating between the port and distribution centers in Fife, obviously Sound Transit’s cooperation in the area is crucial to smooth operation of trucks in the area, particularly with trucks entering and exiting the freeway in Fife. I’m sure they also have concerns about Issaquah Link, since they have trucks that use I-90 as well. The Port throws a lot of weight around, so I think this may be the catalyst for a tunnel. Good for Ballard, the region and the future system, but sad that common sense is only going to prevail due to the Port’s grandstanding. With out additional funding tunneling is out … right? The port made no mention of supplying additional funds. does the Port have the money to fund tunnels? They also wanted an additional analysis for a southern option for the Duwamish crossing. We are done with analysis and moving into selecting the preferred option. Will there be more another west Seattle alignment that gets studied? There will be many adjustments as the planning process continues. Various cost or environmental issues can easily change things. For example, the Downtown Bellevue station moved two blocks late in the process. The Shoreline South/ 145th Station has also been recently been pushed northward 1-2 blocks. Moving elevations and alignments is probably less fixed than stations. As far as the Pigeon Point crossing goes, the advantage is partly to not have a Delridge set of tracks and station tower high over Genesee Street. I could foresee that a cheaper, non-tunnel Pigeon Point option could evolve by deviating northward around the hill — but that would present other environmental issues. With the southern crossing it’s at least possible to have a tunnel station a couple of blocks north of SSC. Yeah this more or less exactly what I told ST, during the Ballard open house last month, would happen with the alignments that touched port property. The port and by extension the fishing industry will not tolerate anything that further degrades their ability to conduct business in and around Fishermans terminal and the Cut. As is pointed out in their letter all of the 15th street bridge alignments would result in the destruction of the only dry dock slips at Fishermans terminal. This is significant as there are very few dry dock slips left that can accommodate fishing vessels in the Seattle area, especially in the Cut. Most people probably don’t understand this but the fishing industry in Seattle is dying. It is harder and harder to justify having any part of the fishing industry operate out of Seattle. This includes everything from the actual boats all the way up to corporate headquarters. Cities like Bellingham are absolutely gunning to take the fishing fleet away from Seattle. The fishermen feel like Seattle doesn’t give a crap about them and 15th ave bridge would just be a physical manifestation of that feeling. The locks are 30 feet deep. They’ll want a tunnel at least 50 feet below the water surface, most likely. With the land elevation on both sides, but especially Ballard, you’re probably looking at somewhere around 70 foot deep stations. The summit of the lift span that would almost never open is 70 feet above the water surface. Would someone please explain to me how putting a light rail bridge above a huge pile of street level crap that is 10 feet tall cause a major disturbance to Fisherman’s Terminal? Really, at worst, an elevated structure there provides a roof for storing said crap. That link was supposed to be to this but I’m not sure why it didn’t work right. Easy because none of the bridge proposals go over that section of Fishermens terminal. The “western” alignment looks like it does to me on the maps they have produced. I really doubt the Coast Guard would reject the construction of a bridge that is higher and right next to another bridge. I think they just have to officially approve it, that’s all. Someone at the Port please explain how adding a light rail station *increases* congestion and how it is not consistent with so-called industrial use. In a corridor that, guess what, actually has quite a bit of *retail*! I guess industrial workers can’t take transit? Bonus if you can explain how a high bridge adversely affects the fishing boat industry…. OK apparently the fishing industry issue is with the loss of dry docks, which seems legit *assuming* the docks are actually being used to capacity. They’re talking about where the light rail will cross the entrance to the interbay port area (where the cruise ships go). Basically they are saying that they don’t want a line of buses or a bunch of pedestrians blocking the only way in. Or some sort of weird at grade crossing that trucks would have to stop and wait for. Which frankly shouldn’t be a problem if they put the station down where the Helix pedestrian bridge already is and run the tracks elevated over that one section (which they probably do anyways). The retail area along 15th does not touch or connect to the port property at all. It’s completely separated by the BNSF lines. If the port wants to dictate where transit can’t go, maybe they can help pay for the more expensive work arounds? What the #$%&%#$@! Sorry, I’m trying not to swear here. But holy cow, that is the worst possible set of options. ST is freakin’ incompetent. They have no vision — no desire to actually provide something of value for the various communities. They just want to build something that looks good on the map, but doesn’t upset too many people. They are working their best to make sure that billion dollar light rail projects are irrelevant to the community. They have completely ignored the advantages and disadvantages of each proposal. The main advantage of an underground station is that you can build a station closer to the heart of Ballard. But instead, they propose building the underground station at 15th! Meanwhile, it has all the disadvantages of underground. It is more expensive. Folks will have to walk farther to get to the platform. They will never extend it (because extending underground is expensive). In other words, they will spend a bunch more money, for something that is *worse* for the average rider! It will take longer to take a train, and they get nothing out of it. The 14th options are worse. One of the few advantages of building an elevated platform on 15th is that it can eventually be extended. But that simply won’t happen with 14th. 14th is a freakin’ dead end at 65th! You can’t go any further. You can’t get up to Crown Hill. That means that instead of extending the line to a new urban village, with a good bus connection to Greenwood, the best they can do is extend this to 65th, which has no bus service. There is no connection from there to anywhere. Speaking of buses, the only other advantage to a station at 15th is that it connects with north-south buses. But not if the station is at 14th! You are asking someone to make a three minute walk (https://goo.gl/maps/wTmERMXLQHG2) every single time they transfer from a bus on 15th to the train! Either that, or the buses make that turn, and spend an extra couple minutes serving the station. You made the system much worse for transit, and guess what — It is farther away from the heart of Ballard! The bulk of your riders have to not only get to 15th, but get to 14th! Don’t let the numbers fool you — it is more than one block (it is basically three). It also means that they all have to cross 15th. OK, OK, I just read the proposal again (the one that MyBallard linked to). For both of the 14th proposals, they said they would “Explore Ballard Station access at 15thAve NW, closer to center of urban village”. Let’s hope so. The fact that they are seriously considering 14th — the worst possible option — is disturbing enough. Let’s hope that they can at least achieve mediocrity by moving the station back to what was originally proposed. It says “the Stakeholder Advisory Group” decided, not “the ST Board decided”. Is this really the final word? Also, is the My Ballard comments section worse than the Seattle Times. Seattle Times comments are full of “taxes are bad” and “government is incompetent”, while this one is full of “homeless people and junkies” as if that’s all Ballard is and transit is. It’s pretty clear that Fourteenth High Bridge will be the northern end of Ballard-Downtown. It’s the only option that doesn’t “require third-party funding”. I would hope that ST will ignore the clamor about “the cruise ships” and use Armory Way at the south end in order to place the Smith Cove Station closer to Expedia and a Prospect portal. It’s also possible to have a hill-climb up to 11th West. The hair-on-fire “concern” about a “dead-end” at 65th is easily allayed by transitioning to a double-deck structure north of 60th and turning onto 65th with a station in the west half of the block between 14th and 15th. Put the platform to the south of the trackways and an elevated pedestrian crossing of 15th makes bus transfers seamless for 15th Avenue buses. Buses on parallel avenues have to turn to access any station, so it’s only the D or its successor that matters. If the route should go farther north, platforms in the south side make the turn north easier also. And now today, Elected officials support 14th Avenue tunnel and West Seattle tunnel ($). This is starting to feel like Bellevue all over again: an expensive tunnel in a useless place. What do they have against a 15th Avenue alignment? Just that 14th is wide? The electeds have spoken. And ST defers to electeds. Something to remember is that if the route is to be extended north, the median in 14th offers a place to transition to an elevated structure. With the alliance between the Ports of Seattle & Tacoma working cooperatively, the majority of residents in the Sound Transit District are also constituents of the Ports of Seattle & Tacoma, and vice-versa. ST & the Port of Seattle need to sit down and have a “come to Jesus” sort of meeting. Have it moderated by an out-of-town big city mayor with no political bias, but an understanding of the issues involved. No neighbors. No “stakeholders.” No outside players. Just ST & the Port & a moderator. And come up with a plan to determine the best solution. That might mean having ST run cost estimates for alternatives A, B, & C, having the Port run cost of delay estimates for the same options, and having both run time of delay estimates for all of their passengers, employees, and cargo. Then, reconvene. These two agencies work for the same set of taxpayers, so why not give us the best run for our money, that balances the needs of both agencies? They need to be working together, not fighting. Seeing this sort of combative relationship is frustrating as a taxpayer. This makes complete sense, Engineer – which is why I fear we won’t see it happen. The areas they don’t want any light rail bridges in are areas the Port would be responsible for cleaning up if the construction uncovered contaminated soil. They don’t want any expensive dirty laundry to be discovered. Would ST test the soil for contamination? It’s not building something polluting or residences. Concrete stanchions would get sick from contaminants? It’s moving contaminated soil, Mike. Those supports can often go quite deep. If the soil is contaminated they’re on the hook. I guarantee soil would be tested; to not do so in an area where it could reasonably be expected puts workers at risk. Of course, ST would as best as possible want to avoid that sort of thing as well, as the delays to mitigate the issue could be substantial even if someone else is paying for it. Terrific post in addition to great assistance! This write-up is very very helpful and ideal for us. Thanks for expressing valuable facts.